Elite 1.5" sheath of Tri-Tech precision inner foams - sponge, high and low density - professionally contoured and sculpted for an intense pin-point target training session for serious athletes. Crafted from select hides of full grain leather for extended wear. 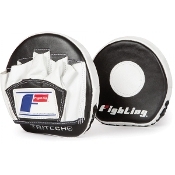 Micro target and punching surface is ideal for elite fighters and pre-bout warm-ups. Super sleek design is ergonomically exact and supplies superior support and protection for trainers through extended workouts and training sessions.